Some research have shown that running barefoot is better than going with the latest shoe. It is shown that the foot is much more flexible when bare and lands on the ground better than when wearing shoes. Look at the picture on the left. You can see he is landing on the forefoot instead of the heel. Shoes don’t allow this form of natural running and cause life-long problems with feet, knees, and back from improper positioning. With a person’s weight gradually going on to the foot, it is much less stress on the knees and hips and greatly reduces, or eliminates, injury. 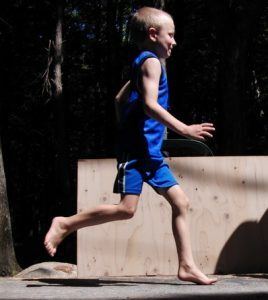 Learning barefoot running at an early age leads to becoming more accustomed to it and starts a healthy lifestyle. Just starting to run barefoot will take time and needs to be done gradually. New muscles are being used that may be weakened from shoes and need to be built up gradually. The runner must also become familiar with different surfaces as grass or cement will have varying impact and heat in summer months. Watch as this young man goes to the front of the pack and wins the race against shod competitors.